We have two great deals to visit both SEA LIFE Birmingham and another local attraction! SEA LIFE Birmingham + Warwick Castle Resort - Dive into a World of Amazing Discovery at SEA LIFE Birmingham before conquering Britain's Ultimate Castle, Warwick Castle Resort! Please note: You must visit the SEA LIFE Birmingham ticket first, at this time you will be provided with a second ticket for use at Warwick Castle. Please note, your ticket for Warwick Castle will be valid for 3 months. You cannot pre-book your visit to Warwick Castle. New for 2018 - SEA LIFE Birmingham and LEGOLAND Discovery Centre Birmingham - Dive into a world of Amazing Discovery at SEA LIFE Birmingham before experience the Ultimate LEGO Indoor Playground at LEGOLAND Discovery Centre Birmingham!  Please note: When booking, you will be asked to select your SEA LIFE Birmingham entry date and time during checkout. Your booking confirmation email will have a link to book and guarantee your LEGOLAND® Discovery Centre Birmingham visit.